Drawing on one’s experience and mixing it with necessary research becomes fodder for creative writing. It’s part of what makes writing historical novels so appealing. In this series, entitled “Betcha Didn’t Know,” I will be explaining some of the unknown history (at least for me) that came to light during the writing of My Darling Dorothy. I hope you enjoy learning more about this era as much as I did. AAA was the administrative arm of the Agricultural Adjustment Act which was passed in 1933. It was a part of FDR’s New Deal and provided much needed relief to struggling farmers who were some of the hardest hit people during (and even before) the Great Depression. The idea was to pay farmers to reduce their production of crops such as corn and wheat, and in some cases, to kill off their livestock. By reducing crop surpluses the value of crops would rise, thus improving the farmer’s condition. In order to pay the farmers correctly aerial photography was utilized to map the landscape. The photos were then used to calculate the area of a farmer’s property using a device called a planimeter. According to Wikipedia, “ A planimeter, also known as a platometer, is a measuring instrument used to determine the area of an arbitrary two-dimensional shape.” Using the planimeter allowed the AAA to more accurately measure a farmer’s fallow land and insure he was being correctly paid. Dorothy and many of her friends worked for the AAA in Beaver City, Nebraska analyzing photos, calculating payments, typing checks and keeping records. The AAA paid well, at least for the times, and my mother made $2.50 per day. She spoke often about how much she enjoyed the job and how much fun it was to have her own money and to spend it on nice clothes. I was intrigued about the interaction among the young women in the office, especially during the war when it became increasingly difficult for some to remain faithful to their husbands. It only made sense that for some, fidelity was extremely difficult. The character Betty describes that sort of challenge. I was also intrigued by the interaction that must have taken place between the young women and the farmers who may have come to the office to get their money in person. As many writers do, I drew upon my own experience, as a youngster, dealing with farmers in my father’s gas station. The character named Mr. Lundquist is a compilation of some of those encounters. Mixing imagination with facts is a challenge for all writers, but when we get it right, it makes for interesting and compelling reading. I for one enjoy being entertained while, at the same time, learning new and interesting information about the past. Seventy-one years ago yesterday, the war in Europe ended. 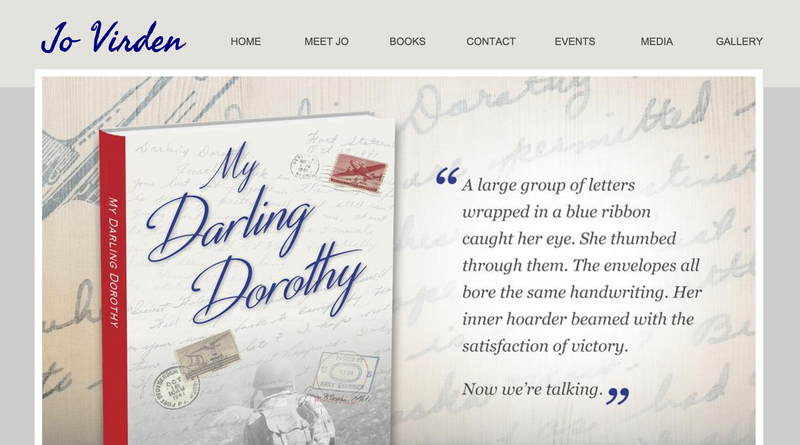 It seemed a perfect time to begin my blog regarding reflections on writing “My Darling Dorothy,” a novel which is set in the decades surrounding World War II. This changed the way I went about writing the chapter in “My Darling Dorothy” which dealt with this historic event. I had to think like a soldier. Why would I celebrate when I am still living in a tent, still eating rations, still sleeping on a cot or in a sleeping bag in a foreign country, far from home and the people I love? While it’s true that they no longer had to worry about shots being fired, the worry and anxiety didn’t disappear, it simply changed focus to, “How and when am I going home?” I learned an important lesson about writing a novel with an historical base, something I should have remembered from my thirty-seven year nursing career: never assume. As I continued reading Smitty’s (my father’s) letters, I learned about where a soldier’s focus shifted. Everything revolved around the Advanced Service Rating score. This was a fascinating discovery for me, something I knew nothing about until I read the following excerpt from the same letter quoted above. Reading between the lines, it’s fairly easy to feel the angst that is masqueraded as humor in his comment about waiting. Imagine making it through the entire war, in Smitty’s case three years, and then having to wait for an undetermined amount of time to go home. As a writer, this creates a challenge; to get the reader to feel the anxiety and worry, just as Smitty did, waiting to find out when it would finally end for him. I’ll write more about the Advance Service Rating in future blogs. Today, I am going to spend a couple of minutes in silence, recollecting that incredible day, and feeling grateful that Smitty made it home.